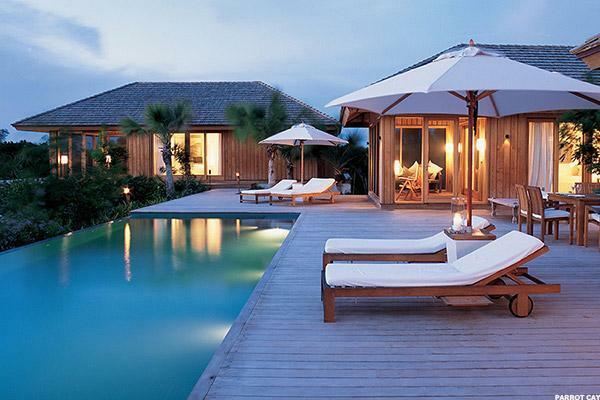 These resorts offer unique yoga classes and programs in spectacular settings. Editor's pick: Originally published August 11. When the stress of daily life starts to weigh you down, practicing yoga can be a great way to relax, unwind and feel renewed. Of course, if you have a penchant for travel and wouldn't mind a little pampering too, you'll be happy to know that there are several high-end resorts throughout the world that offer unique yoga classes and programs, along with luxurious accommodations and top-notch amenities. "We're so over-connected these days that wellness destinations, such as yoga retreats, are a way of getting back in touch with authentic reality," says Carol Perehudoff, a Toronto-based spa and luxury travel blogger for WanderingCarol.com. "They're a prime way to ground ourselves and bring body, mind, soul and spirit back together." From a desert paradise in Arizona to a beachside haven in Thailand, here are five of the best luxury resorts around the globe for aspiring yogis. And don't worry if you're a beginner--these destinations offer instruction for all levels, even if you've never stepped on a yoga mat before. The spectacular 12-million-year-old boulder formations that dot the landscape at Boulders Resort & Spa create a dramatic backdrop for performing your yoga poses. But don't let the rugged desert setting fool you: the resort provides true luxury with its newly renovated guest casitas and villas, two 18-hole championship golf courses, four swimming pools and 33,000-square-foot spa. 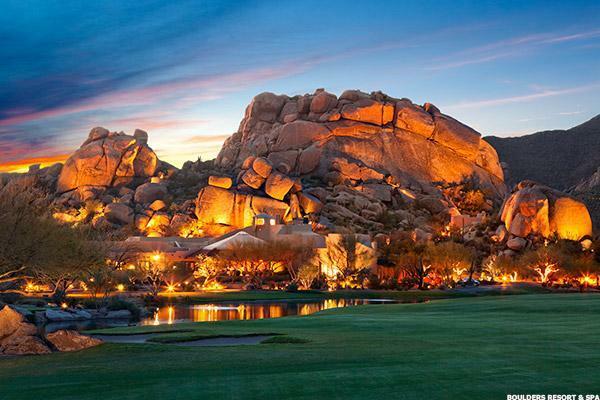 Located about 30 miles north of Phoenix in Carefree, Ariz., Boulders offers an array of complimentary yoga classes for guests, which are taught both at the spa's yoga studio as well as in various outdoor settings. For instance, you can practice your "downward-facing dog" and "tree" poses in the resort's 5,600-square-foot organic garden, which features naturally flowing water, a reflection pond, raised planter boxes, citrus trees and an elevated teak platform for moonlight yoga classes. Or for an extra fee, you can take "Paddleboard Yoga," an hour-long yoga class taught at the spa's swimming pool for all levels. Participants stand on paddleboards while practicing yoga moves, which helps strengthen muscles while bringing peace of mind through the serenity of the water. If you'd like to book a stay, consider staying in a luxurious one-, two- or three-bedroom villa, which starts at $600 per night. 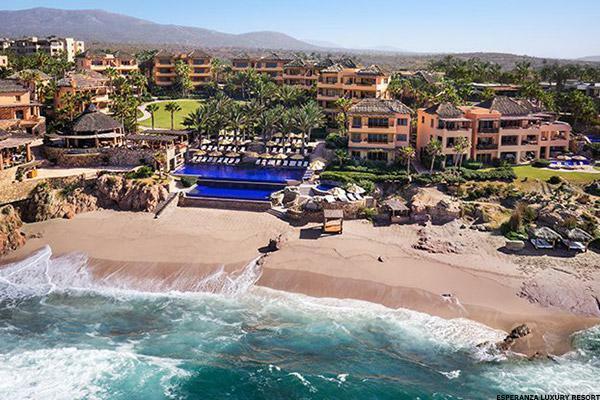 If you're looking to achieve inner tranquility, we don't think you'll have much trouble at this private beach resort set on 17 lush acres overlooking the Sea of Cortez in Cabo San Lucas, Mexico. When you're not enjoying the breathtaking views of the Baja peninsula from your recently renovated guestroom with a private terrace, you can relax your mind, body and soul with complimentary yoga classes, offered daily for all levels in the yoga studio. Guests can also enjoy candlelight yoga on Thursdays at 6 p.m. or sunrise yoga on Saturdays at 7 a.m. Private yoga instruction is also available by appointment in the yoga studio or in your own room ($95 for one hour). Thankfully, your little ones don't have to miss out on enjoying the joys of yoga. Complimentary kids' yoga lessons are held every Wednesday afternoon in the yoga studio for children ages 3 to 8. During the sessions, kids learn basic yoga poses and breathing. Room rates start at $550 per night in the summer and $750 per night during the high season (November through April). 3. 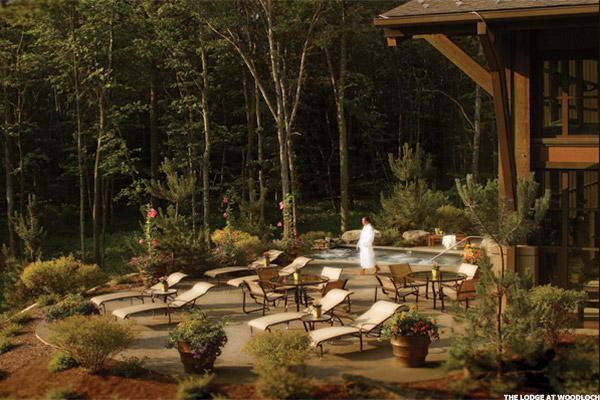 The Lodge at Woodloch in Hawley, Pa.
Tucked away in the Pocono Mountains just over two hours from Manhattan and three hours from Philadelphia, The Lodge at Woodloch promises a tranquil escape from your hectic schedule. Boasting more than 400 pristine woodland acres and a 15-acre private lake, the all-inclusive resort places a large emphasis on health and wellness-and its complimentary yoga offerings won't disappoint. Yoga classes include "The Great Wall of Yoga," which uses gravity and adjustable straps to help open the spine and develop strong core muscles; "Chakra Yoga," in which you use yoga "asanas" (poses) to stimulate and balance your energy centers for physical, spiritual and mental wellness; and "Nature Yoga," where you can connect with nature on a private walking path by combining meditation, abdominal breathing and standing yoga postures. The resort also hosts specialty yoga events throughout the year, in which yoga masters come to the resort to teach complimentary classes to guests for a few days. For instance, from August 18 to 20, yogi and author Darrin Zeer will be teaching such classes as "Thai Yoga Massage" and "Build Strength, Balance & Calm." Weekend rates start at $379 per person, per night based on double occupancy with a two-night minimum, while midweek rates start at around $279 to $299 per person, per night with a two-night minimum. Located on its own private island, COMO Parrot Cay in Turks and Caicos boasts more than 1,000 acres of gorgeous white-sand beaches and lush tropical landscapes. When you're not kayaking on the clear-blue waters or lounging poolside, head to the yoga room aired by natural breezes for a relaxing and rejuvenating experience. Complimentary group yoga sessions are offered six days a week, or for an extra fee, guests can book private yoga instruction, private guided meditation or a private "Pranayama" breathing session. For a more intensive yoga experience, consider booking a yoga retreat at the resort, which includes instruction from top teachers and may also include seminars and therapies. From November 6 through November 12, 2016, a retreat will be taught by yoga teacher Elena Brower, co-author of Art of Attention: A Yoga Practice Workbook for Movement as Meditation (Sounds True, 2016). The retreat includes accommodations for six nights, five hours of yoga instruction daily, three meals a day and round-trip airport transfers (prices are $6,667 based on single occupancy and $8,789 for double occupancy in garden view rooms). 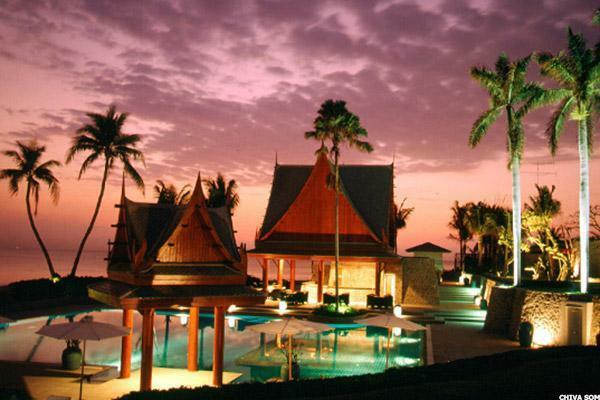 Chiva-Som is a picturesque beachfront health resort located on the Gulf of Thailand, about three hours south of Bangkok. With a staff that includes consulting doctors, naturopaths, fitness instructions, nutritionists and spa therapists, the resort offers a variety of treatments and activities to get your mind, body and soul into tip-top shape. Guests even receive a complimentary health and wellness consultation upon arrival.